When I saw the reports of the fire on the Cuyahoga river, it was hard to imagine how a river could be so polluted that it would catch fire, but that’s exactly what happened. Sparks from a passing train ignited oil-soaked debris floating on the river and fire boats were quickly deployed to try and put it out. Amazingly, the first time the river caught fire was in 1868 and there were several other incidents over the years. The Cuyahoga runs through Cleveland, Ohio and at the time was one of the most polluted waterways in the United States. It empties into Lake Erie and there were growing concerns about the amount of pollution that was being dumped into the Great Lakes. 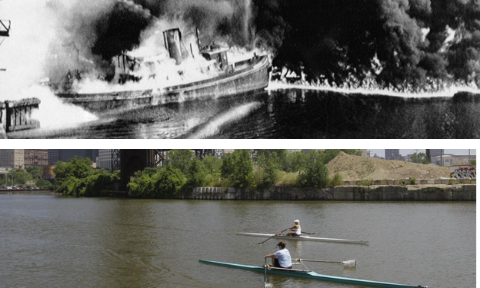 Other rivers had experienced similar fires over the years, including Detroit’s Rouge River, Philadelphia’s Schuylkill, the Chicago River and New York’s Buffalo River. Public awareness and outrage had finally reached the point that action had to be taken. It was no longer acceptable to dump industrial waste and raw sewage into our waterways and pretend it wasn’t having long-term affects on our planet and our health. The Cuyahoga incident was the final straw, eventually leading to the Clean Water Act in 1972, the Great Lakes Water Quality Agreement and the creation of the Environmental Protection Agency. Our school celebrated the first Earth Day in 1970. Reduce, reuse and recycle became the “battle cry” for environmental awareness. People were educated about being good stewards of the planet and leaving the legacy of a healthy environment to their children and grandchildren. As CFM members, we are committed to clean air, water, soils and the wise use of our state’s natural resources. Earth Day 2019 is April 22. We have come a long way since the excesses of the past, but there is still a lot of work to do. We have ample opportunities to get involved in making our planet a better place to live for ourselves, as well as those who will inhabit the earth after us. Volunteer with a Missouri Stream Team, www.mostreamteam.org to help pick up trash in our waterways. Plant a tree for Arbor Day which is April 26th this year. Take part in the Adopt a Highway program. Reduce landfill waste by recycling. Plant native plants and trees to help air quality and provide food for wildlife. Several of our Business Alliance partners, including Forrest Keeling Nursery, Pure Air Natives and Missouri Wildflowers Nursery can get you started with a planting plan. 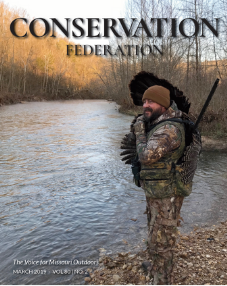 A recent news article from March 2019 announced biologists have concluded that the fish from the Cuyahoga river were now safe to eat. It’s taken 50 years to get to the point that fisherman can actually keep some of their catch for a meal. It shows that we can turn things around and make a difference, but it takes time, resources and the determination to never let things go back to the way they were before. Don’t be a spectator. Stay environmentally and politically aware and make your voice heard for our planet and our future generations.